There was a profound silence. Just silence, no one had anything to say to each other, what could you possibly say? You don’t expect to be so overwhelmed by it all until you step into the camp. It is like two different worlds, the outside and the prison. Outside filled with people talking, eating, drinking – acting normal. Step Inside the camp and no one speaks, there isn’t a smile, there’s an air of complete respect, sadness and apologies. I’m sorry for the pain, the suffering, the devastation. I apologise for every evil action, word and gesture. I don’t say this out loud, it’s an internal apology. All you could hear was the crunch of people’s shoes on the gravel and the guides reiterating the horrific events that took place here in solemn, quiet voices while we all tuned in via headset. The silence, despite the number of people ‘visiting’ was overwhelming, as was the ground i was standing on. When I got back home, everyone was interested in my trip to Auschwitz, it was the topic of conversation – How was Auschwitz? What was it like? Was it sad? It is a wordless experience. Something you can never truly explain to anyone, it is something you have to experience first hand because, I imagine, everyone experiences it differently. A wee bit of history: First constructed to house Polish Prisoners and act as a ‘concentration camp’ and aid to the SS to ease the strain on the local prisons which were now full to capacity due to the Nazi invasion. The land around Auschwitz was ‘cleared’ and local residents were evicted, on the SS guards and families lived nearby. The inmate population grew fast with the Nazi invasions, clearings and evictions. By early 1941 over 10,000 prisoners, mainly Poles, were housed here and this figure continued to grow. As the number of people held in Auschwitz grew, the Nazi’s acquired more land surrounding the camp declaring it a ‘zone of interest’ and secured the fencing with another layer of electrical barbed wire fencing and watchtowers. 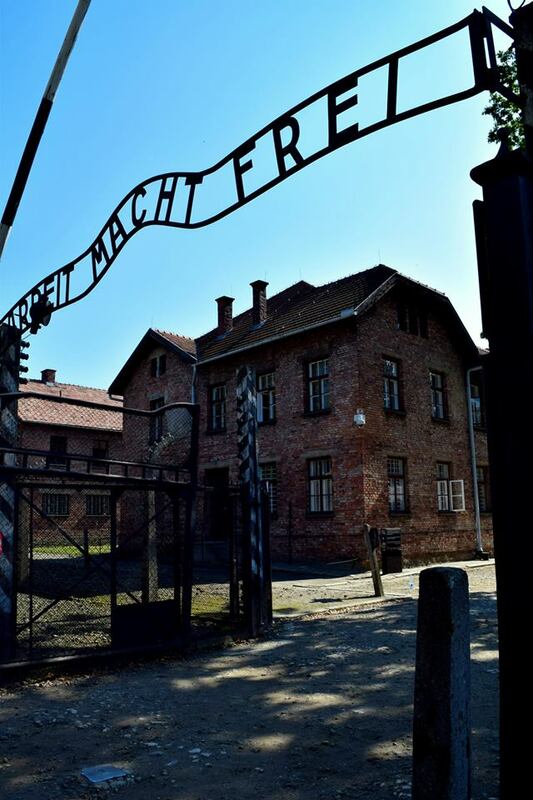 Auschwitz I is the first camp you visit on your tour and on approach you pass through the gates, still standing with the motto “Arbeit macht frei” – Work brings freedom – and enter the ‘Camp’. From here you follow in the footsteps of so many prisoners before you and walk the grounds. Auschwitz is split into different areas, separated by two neat rows of fencing, barbed wire and candy caned street lights with every so often a watch tower breaking the barbed wire trail. This camp feels ‘ordered’ you can tell it was created for a purpose which at first didn’t have the ‘extermination’ order behind it. There were quarters and homes for the SS Guards, Offices and care was put into the construction of this prison. It is only when you learn how the roads are so smooth – prisoners used to be made to pull giant concrete ‘rollers’ along the roads, no stone was allowed to be left loose for fear of SS Guards tripping – it’s only when you look at the side of the buildings and see bullet holes, execution walls and ‘torture hooks’ casually decorating the hidden corners and ‘gardens’ of some buildings that you realise, you have no idea what horrors really lay here. 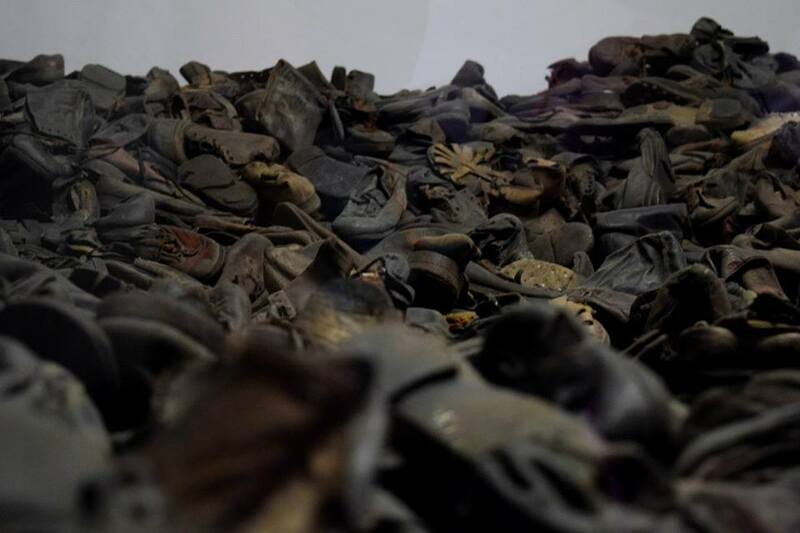 Auschwitz I is where a lot of the belongings still remain for many of the victims. Entering the buildings of Auschwitz you are met with faces – Walls of photographs continuing down corridors only being a handful of what must have been taken – of a handful of victims that perished here. Their eyes sad, the children aged, women with their hair shaved and all dressed identical. You are first lead into rooms with photos taken by SS Guards and Pro Nazi media of scenes in Auschwitz and Birkenau. Real photos of real people. She explains in detail what is happening here, there is so much more than the history books here. You are lead into more rooms and objects start to come into display. In small amounts at first, a few combs, some plates, hair brushes. Then you are lead into bigger rooms. Here, on display you have piles upon piles of hair. Hair shaved from women, men, children all collected here behind glass – No photos allowed out of respect to the victims. She explained the hair was sown into clothing, used for duvet stuffing, shipped back to Germany for any use necessary. The SS Guards were literally wearing the victims hair sown into their uniforms to keep them warm, while the victims suffered. The next two rooms were Shoes. So many shoes. Women’s, Children’s, Men’s shoes taken off them while they ‘changed for showers’. The soles all removed to be reused, the shoelaces now mostly disintegrated due to time. The next room was Suitcases and Luggage of any kind. Most, with names and dates of birth marked on with the occasional unique symbol in the hope they would stand out when coming back to be collected – but they were never collected. We were asked to pay close attention to the suitcases and the dates of birth on these – many would have still been alive today, they were so young. 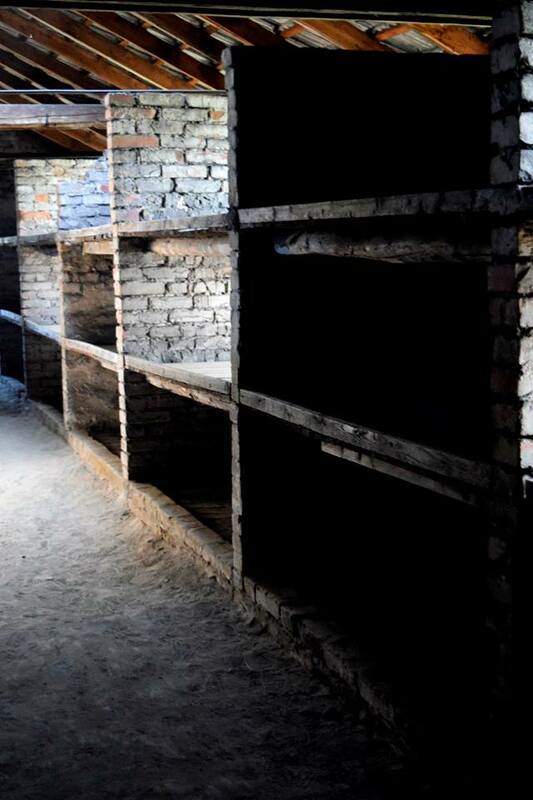 To end the tour of Auschwitz I you are lead into the basement of some of the ‘houses’. Here prisoners were made to stand in rooms, in complete darkness where they would then suffocate because of so many bodies crammed in. Tiny rooms where prisoners were forced to crawl into until they could fit no more and left there, unable to move for days. You could still see the scratch marks on the walls from panic. The Gas chamber is terrifying. Walking down into the chamber – which also has a crematoria attached – the holes are in the roof where the ‘shower heads’ once were. Dark and eery, I wanted to get out just as soon as getting in. A wee bit of History: Auschwitz I was first constructed to help with the congestion now being experienced in Auschwitz I main camp. This camp would go on to hold more than 200,000 people at a time. By 1941 they began ‘exterminating’ the Prisoners and repositioned the camp as a combination of labour/extermination camp – to give you an idea, in October 1941, 10,000 Soviet Prisoners arrived and by March 1942 only 945 were still alive – Those that survived the initial first months were then transferred to Birkenau, this did not improve chances for the ‘Prisoners’ in fact most would go on to die from disease and starvation in just a few months. The first gas chamber was operational in 1942, soon after this a second, a third and then a fourth was built. Each one bigger than before. These were used for mass murders until mid 1943. It’s a place of nightmares. There is no hidden promise here, it is unwelcoming, intimidating and you have no words, the breath is kicked right out of you when you realise the sheer size of the place. Staring back at the ‘reception building’ with the train tracks leading through, it is the picture of terror. The iconic image of the destruction, devastation and lives taken during the Nazi reign. Thinking it was terrifyingly unwelcoming now, I can’t imagine what it would have been like to arrive in 1942. Your guide is still with you in Birkenau but there are no headsets. There is still so much silence. More so here, than Auschwitz I. You are walking the same path people took from the train to the Gas Chambers. From the train to work houses. From the train to their inevitable death. You remember the photos you just saw, all the information you had been told while you follow the paths of those poor souls that experienced it. Many of the houses are now deconstructed shells due to the need for reusable materials after the war to house the homeless and imprisoned. It doesn’t make it any less fearful. Visiting mass graves – and now set up – memorials for the dead, it is hard voice anything let a lone a sentence worth any meaning. Entering one of the still standing ‘houses’ you see the ‘bunk beds’ in which up to 4 or five people would sleep at one time. Those dreadfully ill would sleep ‘under’ the beds on the floor, those relatively sick or injured on the first levelled bed and the ‘healthy’ on the top – this was to stop the ill quickly infecting the ‘healthy’ from wearing wounds or Feces leaking through the wooden slats – the floor was mud. The ill quickly died by sleeping on the floor in amongst the mud. Upon leaving Auschwitz & Birkenau there are no words that can describe to anyone else the impact this place has on you. The opening and promotion in tourism for Auschwitz & Birkenau has been criticised over the years and is accused of promoting ‘death tourism’ but this, in my opinion holds no validity. It is so important for Auschwitz and the ‘death camps’ to remain open to visitors. Because when I returned home from Poland and talked about Auschwitz my sister asked me ‘what is Auschwitz? I’ve never heard of it’. With the ever-changing world we are living in, this should be an event in history which is never forgotten because we can not allow it to happen again. Thanks for sharing, I agree that it’s important to keep places like this open to remind us of the past. Even if it isn’t a pleasant experience to visit, it really makes the horrors of the past real for visitors.